These Express Menus contain our most popular pages. New customers can sign up online. It's fast and easy. 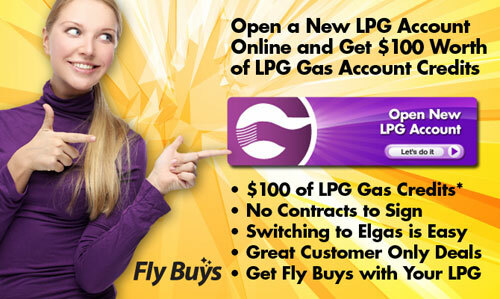 A special offer for new customers who want to get started with Elgas that includes $100 worth of gas account credits and much more. A brief explanation of your delivery options including our EasyGas™ tanker delivery and Exchange gas bottle services. There is even a short video that shows how EasyGas works. Important things to consider when you evaluate LPG gas suppliers. Everything you need to know if you are new to home LPG. "How-to" instructions and frequently asked questions specifically for new LPG users. Information you need if you are adding LPG gas and appliances to your all-electric home. The process is explained in five simple steps. Now you can order your gas bottle with a simple Text (SMS) message. You also get automatic Gas Check Alerts™, by Text, on your mobile telephone so you'll never forget to check your gas bottles again. Existing customers can make payments, order gas, check delivery dates, download duplicate invoices and much more all with just a few clicks. Its quick, simple and no special password is required for residential customers. Just enter your customer number and surname and you are ready to go. Details on convenient options including Direct Debit, Online, Pay-By-Phone, Pay-By-Mail or pay in person at your local branch. You can browse through our range of NZ LPG appliances including heaters and hot water appliances. Our quality brands include Rinnai, Bosch and more. Check out our current promotions and get all of the details. Everything you need to know to contact and find us. FAQs for those who want to be in the know.